We are dedicatedly involved in providing an excellent quality array of Milky Vacuum Pump, for catering the various needs of our clients. Turbo Blower" Pumps are manufactured in our well equipped factory with the latest developed technology to meet the varied need of the industries & institution. 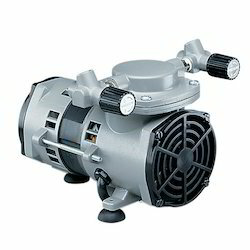 "Turbo Blower" Vacuum pressure Pumps are of the oil immersed rotary vane type V belt driven. A stator with an eccentrically mounted rotor within it from the main assembly. The rotor has two vanes facing each other. There are springs in between the two vanes. As the rotor revolves these springs press the vanes against the inner wall of the stator and make them move in and out of the rotor as the rotor revolves by means of a driving shaft sweeping the air space twice per revolution. Material of construction is properly chosen graded cast iron and all the parts are precisely machined micro finished and assembled to close tolerances for high efficiency. ACCESSORIES FOR "TURBO BLOWER" VACUUM Pressure PUMPS Non Return Valve It is provided for preventing body leakages with the help of spring tensioned rubber diaphragm. 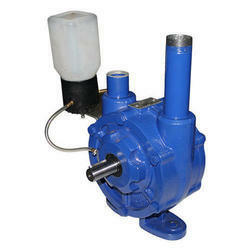 The rubber diaphragm prevents back flow of oil when the pump is not in motion. Air Ballast This is designed for removing condensed vapour in the pump so that contamination of oil is avoided. Moisture Trap Available in C.I./AL with detachable glass. The moisture in the air is absorbed by this trap before entering into the pump. Inlet Dust Filter Vacuum Gauge with Regulator This Filters Dust particles down to 20 micron size. This is being used as to maintain any desired vacuum in the system. It is graduated from 0 to 30 inches in mercury. GUARANTEE Service after sales with one year guarantee against manufacturing defects. NOTE Models up to ME-15 are air cooled type & provided with single phase Motors. 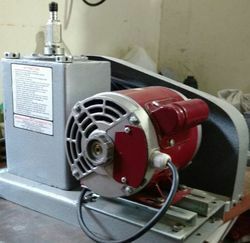 Models from ME-16 onwards are provided with water cooling jackets and 3 phase Motors. We are dedicatedly involved in providing an excellent quality array of Oil Sealed Vacuum Pump, for catering the various needs of our clients. Turbo Blower" Pumps are manufactured in our well equipped factory with the latest developed technology to meet the varied need of the industries & institution. 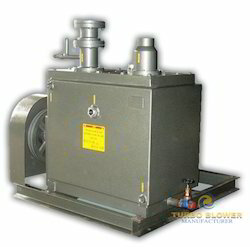 "Turbo Blower" High Vacuum Pumps are of the oil immersed rotary vane type V belt driven. A stator with an eccentrically mounted rotor within it from the main assembly. The rotor has two vanes facing each other. There are springs in between the two vanes. As the rotor revolves these springs press the vanes against the inner wall of the stator and make them move in and out of the rotor as the rotor revolves by means of a driving shaft sweeping the air space twice per revolution. Material of construction is properly chosen graded cast iron and all the parts are precisely machined micro finished and assembled to close tolerances for high efficiency. ACCESSORIES FOR "TURBO BLOWER" VACUUM PUMPS Non Return Valve It is provided for preventing body leakages with the help of spring tensioned rubber diaphragm. The rubber diaphragm prevents back flow of oil when the pump is not in motion. Air Ballast This is designed for removing condensed vapour in the pump so that contamination of oil is avoided. Moisture Trap Available in C.I./AL with detachable glass. The moisture in the air is absorbed by this trap before entering into the pump. Inlet Dust Filter Vacuum Gauge with Regulator This Filters Dust particles down to 20 micron size. This is being used as to maintain any desired vacuum in the system. It is graduated from 0 to 30 inches in mercury. GUARANTEE Service after sales with one year guarantee against manufacturing defects. NOTE Models up to ME-15 are air cooled type & provided with single phase Motors. Models from ME-16 onwards are provided with water cooling jackets and 3 phase Motors.